Landline fiber optic communications cables first went into service in 1977, but, as with copper cables, ensuring reliable operation using optical fiber cables under water was a task of a higher magnitude. By the early 1980s optical fiber submarine cables were under development in Japan, Britain, France, and the USA, and a number had been successfully tested in shallow water. In the United States, Bell Laboratories and the Simplex Wire and Cable Company jointly researched fiber optic submarine cables, and in 1978 Bell Labs manufactured a prototype, the first ever made. 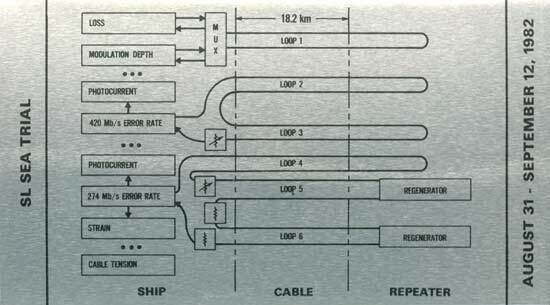 Bell Labs also worked with Western Electric to develop an integrated-circuit-based optical submarine repeater. 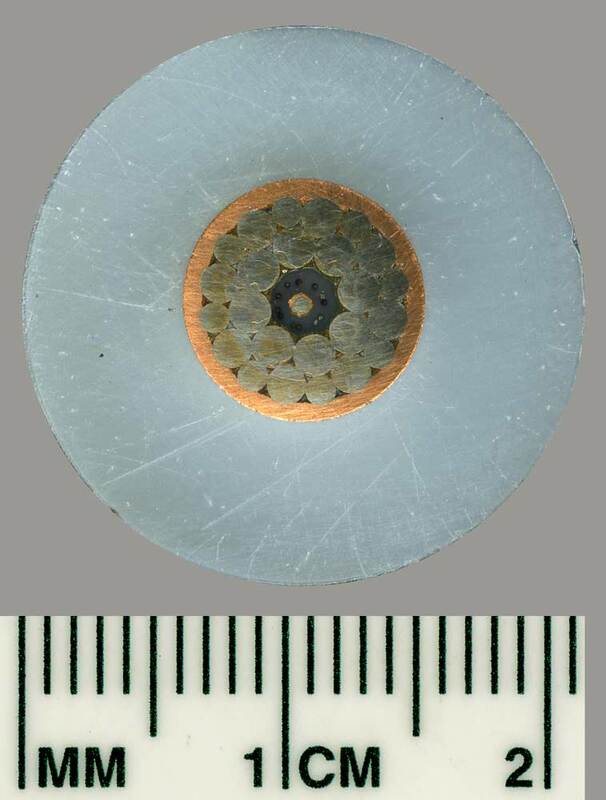 By late August 1982 a length of 18.25 km of lightweight fiber optic submarine cable, type SL, had been manufactured by Simplex, and the cable and a repeater with two 274 MB/s regenerators were ready for test. of a lightwave communications system in September 1982. 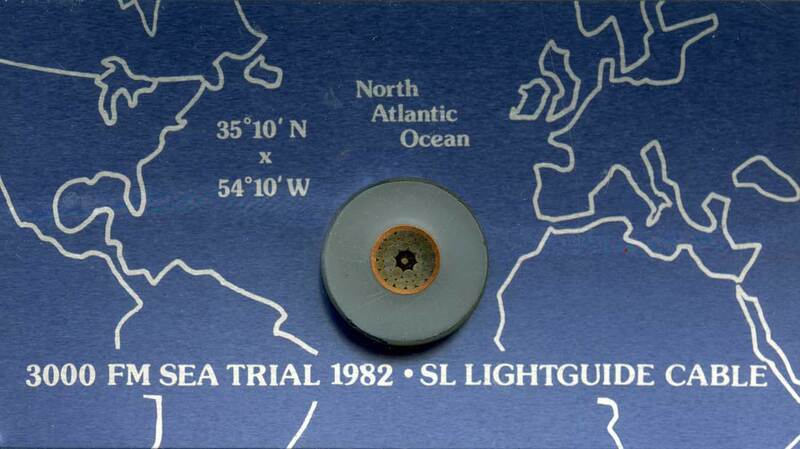 A deep-sea trial was conducted between 31 August and 12 September 1982 using CS Long Lines. The cable and repeater were laid in an ocean depth of 5,500 metres in the North Atlantic, about 500 miles from Bermuda; the run also included a number of splices. Tests showed that transmission losses due to temperature, tension, and pressure changes were negligible, and the cable and splices survived the stresses of laying and picking up without any fiber breaks. This was significant in being the first-ever deep-sea trial of a fiber optic cable system. The deep-sea trial was followed by further development of the components of the system. In 1986 a short SL system was installed between Gran Canaria and Tenerife in the Canary Island chain (OPTICAN), where it served as a test vehicle for its planned use in the upcoming TAT-8. 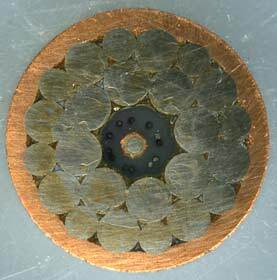 When TAT-8 was laid in 1988 it became the first optical fiber cable to span the Atlantic. 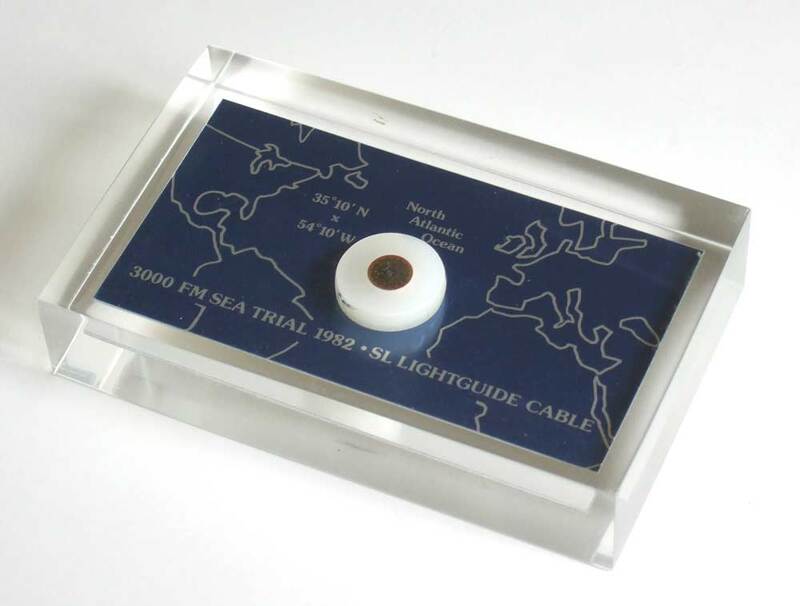 The desk display shown above commemorates the 1982 sea trial, and includes a sample of the SL fiber optic cable, a map of the test location, and (on the reverse) connection details of the cable and equipment used in the tests. The central core is 2.6mm in diameter and contains twelve optical fibers embedded in elastomer and wound around the central steel wire. Steel strands act as a strength member, and these are surrounded by a continuously welded copper cylinder, which is a water and hydrogen diffusion barrier. This also carries the power for the repeaters. An outer layer of low-density polyethylene provides cable insulation and abrasion resistance. Recover active cable, repeater, and tail cable. 18-km cable and repeater performed as expected during laying, holding, and recovery operations in 5.5-km deep water. Error-free transmission of 274 Mbit/s and 420 Mbit/s was demonstrated during 1-h test periods in all phases of operations. Maximum loss change due to temperature, tension, and pressure was less than 0.1 dB under all conditions. The cable, repeater, and splice box were recovered in original working condition. 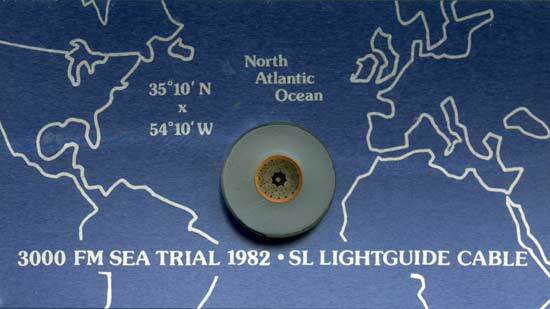 View 1982 SL Cable Sea Trial in a larger map. Yellow marks Bermuda; blue the location of the sea trial site. 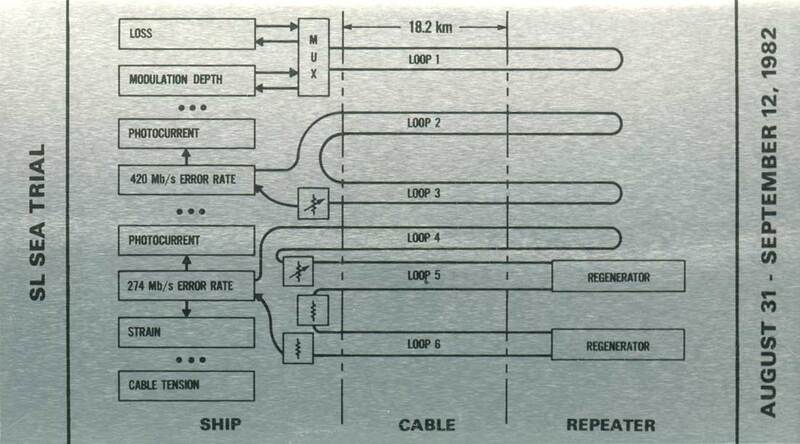 Shimura, S., Editor: International Submarine Cable Systems, Tokyo, 1984, KDD Engineering and Consulting, Inc.
Runge, Peter K. and Patrick R. Trischitta: Undersea Lightwave Communications, New York, 1986, IEEE Press.